Some hotels put bags on absolute lockdown, in private rooms equipped with security cameras. (Hats off to Vegas.) 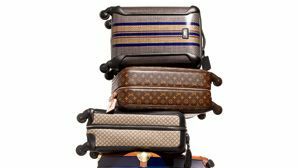 Others simply stash luggage behind the bellman’s desk. Before dropping your bags, evaluate the setup and ask how the area is secured. And consider carrying with you anything valuable enough to go in the hotel-room safe. $1 Million: The rumored value of jewelry stolen from a hotel room during the 2013 Cannes Film Festival.